Many may have been told they have a refractive problem by their eye care professional and not understood clearly what was meant by this. The word refraction is used to describe the way light is focused by your eye. It depends on three elements: the curvature of the cornea, the power of the lens, and the length of the eye. If these elements are structured correctly then light will focus on the retina properly. However it is not unusual for one or a combination of these to be structured imperfectly. This irregularity results in a refractive problem. A myopic eye has too much focusing power. The extra focusing ability is the result of an eyeball that is too long or a cornea that has excessive curvature creating a steep surface. When an eye has too much focusing power, the image falls before the retina and therefore cannot be transferred to the brain for processing. Those with myopia see distance objects blurred. Near objects; however, can be focused clearly since they usually require additional focusing power to produce a clear image. A hyperopic eye does not have enough focusing power. The lack of focusing ability is the result of an eyeball that is too short or a cornea that does not have enough curve. This creates a flat surface. When an eye lacks focusing power the image being focused falls behind the retina and as a result is not sent to the brain for processing. Those with hyperopia can see distance objects clearly since it usually requires less focusing power to see these images. Near objects however are blurred. An astigmatic lacks a uniform surface which results in the inability to have one focal point. This asymmetry is due to the cornea being curved on one place more so than on the other. It is easier to understand this concept if you consider a normal eye to be the shape of a tennis ball (spherical) and an astigmatic eye the shape of a football (toric). Usually astigmatism is the combination of both myopia and hyperopia and therefore both distance and near objects are blurry. Refractive problems are measured in units called diopters. This represents the amount of correction needed in corrective lenses to normalize vision. If an eye is myopic a concave or minus lens is used. For example if a myopic eye has 9 diopters of extra focusing power, this extra power would be balanced with a minus 9 diopter lens. If an eye is hyperopic a convex or plus lens is used. For example a hyperopic eye that is short 3 diopters of focusing power, would be given a plus 3 diopter lens. In addition, combinations of plus and minus lenses are used to correct astigmatism. The higher the number of diopters needed in lenses the greater the refractive problem. In summary up to 6 diopters of correction is considered low, between 7 and 10 is considered moderate and beyond 10 is considered high. Glasses are the most common aid used to correct refractive errors. The advantages glasses offer include lower cost, easy maintenance, and versatility. Disadvantages however include change in cosmetic appearance, limited lifespan, restriction of peripheral vision and interference with recreational activities. Although surgical methods of correction are becoming increasingly popular today, glasses will always remain a reliable source of correction. Contact lenses have become a popular alternative to glasses. Some advantages contact lenses have over glasses include a more precise vision, more freedom during recreational activities, and less detraction from appearance. Contact lenses however do not come without their own problems. First, they require regular cleaning otherwise serious infections can occur. Second, not everyone can tolerate a contact lens. Some eyes are too dry or sensitive. As well, such refractive problems as high degrees of astigmatism cannot be corrected with contact lenses. In short, although an alternative for some, contact lenses still fall short as a solution to refractive problems. 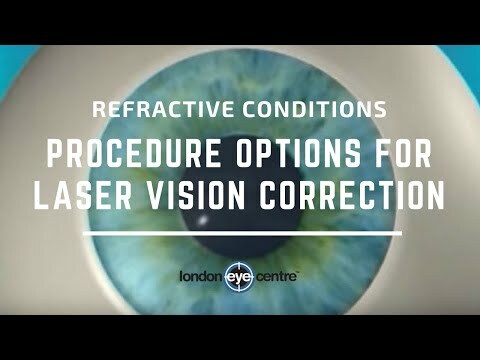 In an attempt to correct refractive errors, several other non-surgical techniques have been introduced over the years, including eye exercises, acupressure, and orthokeratology. These methods may lead to temporary improvement, however they have not proven to be a permanent solution. Since refractive problems are the result of an anatomical irregularity, methods that do not offer a change of the anatomy's structure cannot offer any lifetime solution.